In July 2015, B.C.’s Gaming Policy and Enforcement Branch (GPEB) grew suspicious after noticing some sketchy activity at River Rock Casino and Resort. The Richmond gambling facility had been accepting huge bundles of $20 bills — cash buy-ins of more than $500,000 at a time. The money was from an unknown source and untraceable, often dropped off at the casino or just outside at unusual times, including late at night. All sorts of red flags went up. The GPEB commissioned a report to get to the bottom of the situation. A year later the report was delivered to then-Minister of Finance, Mike De Jong. It was scathing in its assessment of River Rock Casino and the government’s oversight of the gambling industry. The numbers are shocking — investigators found a total of $13.5 million in $20 bills was turned into chips at River Rock Casino in July 2015. For context, that many $20 bills would stack up to the height of a 20-storey building — almost double the size of the 12-storey River Rock Casino building itself. The report was delivered in July 2016. Then, nothing. It sat on the shelf, until a year later when a new government came in and a new Attorney General picked it up. The question is why? Why did the BC Liberal government, including the minister responsible, Mike De Jong, and Premier Christy Clark ignore the damning report? To date, the casino itself has donated $3,800 to the BC Liberals. But River Rock’s parent company, Great Canadian Gaming Corporation, is an even higher roller when it comes to political donations. In the two years leading up to the the 2017 provincial election, the BC Liberals received $114,704.65 from Great Canadian Gaming Corporation. The company donated to the BC NDP and the BC Conservative Party before 2015. However, in April 2015 Great Canadian started writing cheques to the BC Liberals. This was not during any election campaign, but was just months before the government initiated its investigation. Since then, the lion’s share of Great Canadian Gaming Corporations’ donations have been to the BC Liberals. It’s serendipitous that a company would suddenly change its political ideology at the same time it started being put under the government’s microscope. 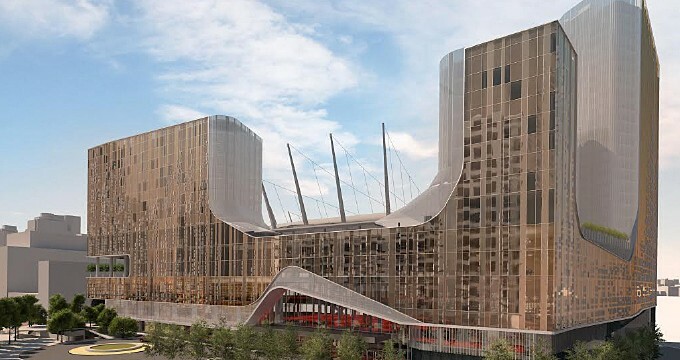 It turns out the company that produced the River Rock report, MNP LLP, also did work for a rival casino — The Edgewater — which moved into the new Parq Vancouver centre last month. After bringing the damning report on the River Rock Casino out into the sunlight, Attorney General Eby had his intentions questioned. Interesting timing, critics were quick to point out. Eby didn’t commission the report, so he didn’t choose the company that produced it. But the BC Liberal government did, and the reasons for selecting MNP for the review are unclear. River Rock’s competitor, the newly minted Parq Vancouver comes with a very interesting story itself. The colossal building features two hotels, a spa, eight restaurants and, as mentioned, the converted former Edgewater Casino. Parq Vancouver is located next to False Creek, right next to B.C. Place Stadium. Edgewater, and now Parq Vancouver, are both owned and operated by Las Vegas company Paragon Gaming. How did the casino land such a prime location in downtown Vancouver? The 70-year lease was awarded by the crown corporation B.C. PavCo (who manages B.C. Place) under BC Liberal premier Gordon Campbell in March 2010. The government maintained that there were multiple proposals for the lease, the bidding process was competitive and Parq Vancouver won fairly. But a few days later, journalist Sean Holman revealed that the situation wasn’t as cut and dry as the government led us to believe. Enter T. Richard Turner — chair of the B.C. Lottery Corporation until December 2005. Six months after he resigned from the BCLC, he joined the board of Paragon Gaming and within months the company purchased Edgewater Casino. More than just a government friend — close enough to be appointed the chair of a crown corporation — T. Richard Turner is also a BC Liberal donor, personally giving $17,600 to the party between 2005 and 2007, then giving through his companies from 2007 to 2009, including a cheque for $50,000 on the day of the 2009 election. So, we have a BC Liberal donor and former crown corporation chair with political connections, join an American company that subsequently bought a Vancouver casino and then was awarded prime real estate from the government to rebuild it bigger and grander. Paragon Gaming maintains that Mr. Turner had no influence over the bidding process for the spot next to B.C. Place. But in a follow up piece, Sean Holman released new information — the BC Liberal tourism minister Kevin Krueger admitted he got a phone call from Mr. Turner during the lease negotiations, requesting that B.C. Place be fitted with an incredibly expensive, taxpayer-funded retractable roof. His argument was that the whole franchise would become more attractive for sports, indirectly benefiting the proposed casino next door. So in June 2009, Mr. Turner was discussing Paragon’s new casino contract with the government, nine months before the lease was awarded. Was the bidding process truly fair and open? Was a retractable B.C. Place roof the best use of taxpayer money? And crucially, did a well-connected party donor try to exert influence over these decisions? We don’t know. Because even though Holman persistently tried to FOI related e-mails, Mr. Turner fought him in court to keep those e-mails a secret. Parq Vancouver was originally supposed to open in fall 2016, but on June 29, 2016, the company announced it wouldn’t be opening for another year. The report about River Rock Casino was finished, and subsequently shelved, in July 2016. Why was the report ignored? Why was the public kept in the dark about duffel bags of drug money being dropped off at B.C. casinos? Thanks to investigative journalists Sean Holman and Sam Cooper, we now know what questions to ask. But until we have a proper investigation into campaign finance in B.C., it will be hard to know conclusively how corporate money may have played into political decisions. We deserve answers. Join our call for a Corruption Inquiry in B.C. Good Liberal Government,why can’t I get bribed like that’s? The truth should be presented in the light of day, by everyone responsible, otherwise we willfully impose a grave threat to our Creator gifted life resources that we are to manage wisely for all future generations. And big surprise, the Ontario Liberals just awarded Great Canadian Gaming with not one, but two contracts to run slots and casinos. This despite knowing that there is an investigation ongoing into the money laundering. So how much did they donate to Wynne? How young/gullible are all the folk that are surprised that gambling facilities are magnets for corruption? But of course, above all else, politicians must look for “donations” then arrange sweetheart deals for companies that may provide them with bountiful employment when they are finally voted out..